Minimax hifi gear is produced in Hongkong by Alex Yeung, who is technical designer, too. Until now, Minimax has launched preamps, power amps, integrated amps, a CD player, and a last a phono stage. I already had the pleasure to test the power amp and line stage and some time earlier for TNT audio. 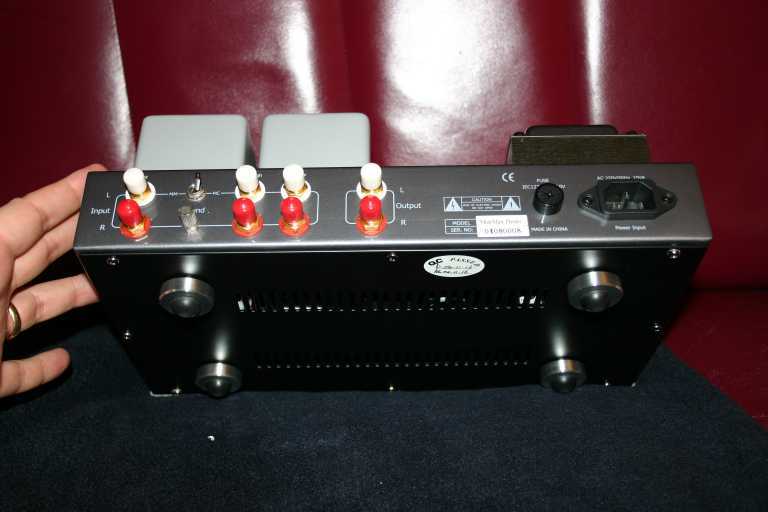 With 1499 EUR this phono stage is a bit more expensive than the other components offered by this manufacturer. This is no wonder to me, as designing and making a good sounding phono stage has always been a challenge for designers and manufacturers, and even more today, when low production volumes for vinyl gear promise less profit for producers. This phono exhibits quite an extraordinary build quality, and on first sight resembles me a lot of the very fine looking Sun Audio tube electronics. Sun Audio is known as Uchida in Germany, where Sun Audio is the protected name of the local Mark Levinson importer and cannot be used because of naming conflicts. The outer appearance tells stories about the topology of the phono. The big screening cages of the moving coil transformers are difficult to overlook. Then there are two power supply transformers, which are connected inside for the right line voltage, and a 6X4 rectifier tube. 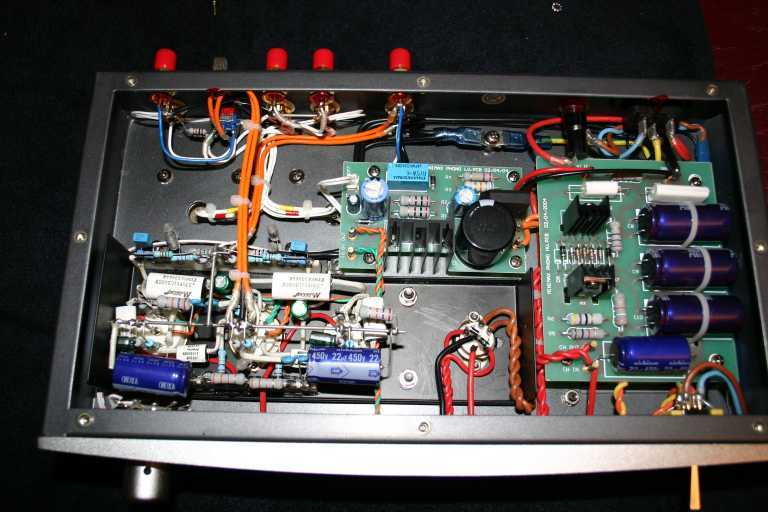 On the front plate there is a mute switch, which shorts the outputs to ground via a relais, and on the back plate you can see what this switch is useful for: no less than three phono inputs are there, one moving magnet and two for moving coil low respective high, because the moving coil transformer happens to have to input primary connections, which can be selected by using the assigned input. With a toggle switch moving magnet and moving coil can be selected. What is hidden inside is the power supply choke, as well as the labour intensive point-to-point wiring technique for connecting electrical components. This rather obsolete technique is only to be found in top tube gear today. 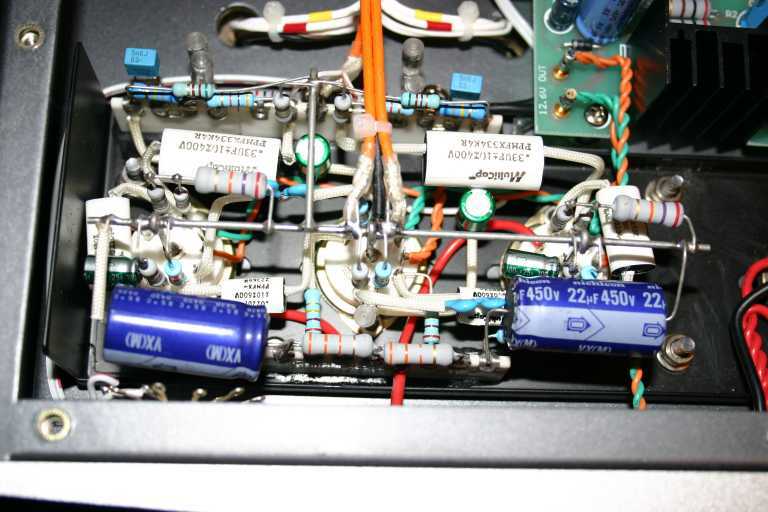 The circuit used in this phono is old and well known: three tubes ECC83 supply for two gain stages and one follower in the output stage, and the RIAA correction is done actively in the feedback loop. Obviously you have seen this in lots of other tube preamps like MacIntosh C22, Marantz C7, or, if one forgets the cathode follower, in Shindo preamps of today. What the Minimax phono has in common with modern Shindo gear is not only point-to-point wiring, but also regulation of high voltage with solid state devices. Off the shelf the Minimax phono is equipped with tubes labeled Eastern Electric, but the German distributor also provided me with a set of old Telefunken and Valvo ECC83 tubes. Well, first class build quality, well proven circuit, nothing could go wrong, I thought. No way! The first review sample, being made in a prototype production run and delivered to me in 2004, failed to impress me, so I rather sent it back to the distributor. In the beginning of 2005, I got a fresh production quality sample instead. This second sample seemed to be changed a lot, because even right out the box, it sounded good to me. Burning in did not take long, at least I could not detect any nasty things during the first hours. After the sound had stabilized on high level, I listened a lot with this phono and could make comparisons with other gear around in my listening room. Because I am owning only low output moving coil cartridges, I tested only the MC-low input. At the input was connected a Red Rose Petal (produced by Myabi). In order to draw conclusions about the quality of the internal Minimax moving coil transformers, I sometimes used an external moving coil transformer for comparison. This was then connected to the MM-input, of course. It is already some years back, when Tori Amos launched her impressive recording Boys for Pele. For me the vinyl edition as double LP in clear vinyl is both listening pleasure and audiophile fest. Songs are sung with tension and her song texts are always with a meaning so deep, that the listener can’t get it even after hearing it hundreds of times. At the same time the album is full of audiophile details, mixed in lots of tracks. On bad equipment, this vinyl sounds very bad, the voice gets scratchy and unpleasant, details become blurred, but on high level setups, you can be deep diving into the music. Because of this double nature, I am listening quite often to this vinyl, and I am also using it as benchmark for high level analogue playback. The corresponding CD edition is also phantastic, BTW. First I connected the Minimax phono into the line stage of the Shindo Monbrison, where a 250k volume pot is waiting for input signals. Well, I did not expect any wonders, and of course nothing special did happen. Concerning musical flow and natural timbre the Minimax phono was about equal to the Monbrison phono stage, but when resolution of sibilants was required, the Monbrison scored with more fine detail and resolution, as well as in differentiating the single tracks on Boys for Pele. Tonally the Minimax phono was leaner, though that did not wonder me either, because Shindo preamps always had and have a RIAA which is voiced to the warm side of life. Changing the tube complement to old tubes in the Minimax phono changed the sound to the better, but the overall impression of differences between Minimax and Shindo did not change. I could speculate about the role of synergy effects between Shindo line and phono, and the role of the interconnects between Minimax phono and Shindo line, but all I could do was trying the Minimax phono with other line stages, too. 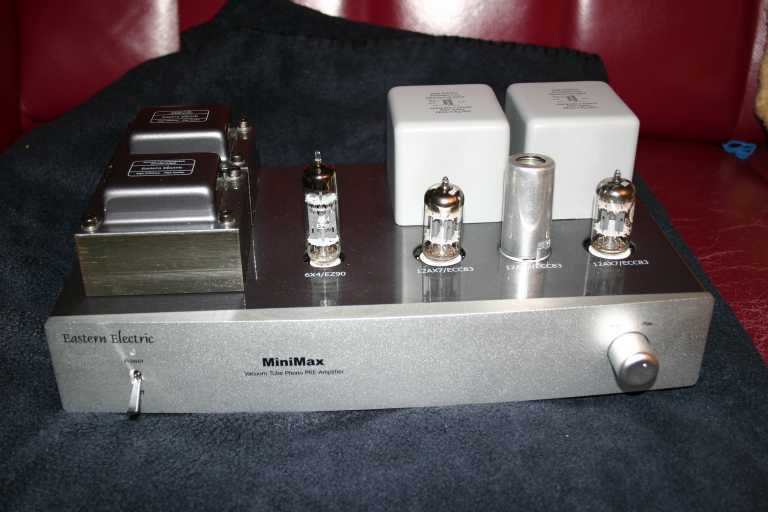 The Minimax phono was indeed better, when connected to my own transistor line stage or to transformer line stage built around the Steven & Billington transformer volume pots. Bass lines got more weight, and the music had that special engaging toe tapping character often granted to british amplifiers. The repetitions on Philipp Glass’s LP The Photographer were depicted in their development and also in its small deviations, so the music could not get boring. The combination of Minimax phono and the transformer line stage played more neutral the Shindo, but with less transparency, and I have to admit, with less charme. If I was to define the character of the Minimax phono, then I would describe it as clear, neutral, dry. Though the dryness gets a lot better with NOS tubes. In this respect, the Minimax phono resembles a lot the Conrad-Johnson tube amplifiers. Summing up, there is only minute tube sound inside this phono, and on the contrary this phono is able to put shame on a Naim NAC82 equipped with HiCap, because it does the PRAT thing equally, but has more resolution and plays more neutral. Another advantage of the Minimax phono is, that it takes only five minutes to warm up and play tunes, whereas lot of British transistor gear take days or even weeks to play tunes, even after a short power off. Of course I had to try my reference moving coil transformer, the Jensen JTX-346ATX, with the Minimax phono. Result was that it could not beat the internal moving coil transformers, as I found them to portray bass lines better than my reference. This is an excellent result, setting the quality bar of the Minimax considerably higher than the EAR 834P, which not only sounds less balanced, but also is - optionally – equipped with lesser moving coil inputs. Summing up, the Minimax phono is a very convincing offer in the so called middle high-end segment, where sometimes it is possible to get 90% quality for 30% price.